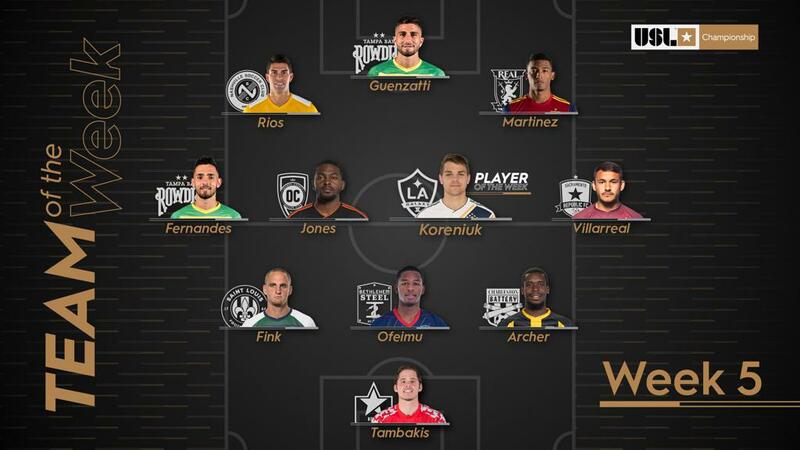 TAMPA, Fla. – LA Galaxy II midfielder Kai Koreniuk has been voted the USL Championship Player of the Week for Week 5 of the 2019 season. Koreniuk led Los Dos to its second consecutive victory with two goals in the span of four minutes early in the second half and added an assist on the Galaxy II’s final goal of the night as the side moved up to fifth place in the Western Conference standings. Koreniuk received 42 percent of the poll conducted by a national panel of independent media representing every USL Championship market. Nashville SC’s Daniel Rios finished second with 21 percent after his two-goal performance led NSC to a 3-0 road victory against Ottawa Fury FC. GK – Alex Tambakis, North Carolina FC: Tambakis recorded four saves to keep his side in the game when down to 10 men as NCFC rallied for a 1-1 draw against Memphis 901 FC. D – Sam Fink, Saint Louis FC: Fink scored one of STLFC’s two goals, blocked two shots, made six clearances and won 3 of 4 duels to help lead his side to victory on the road against Atlanta. D – Ben Ofeimu, Bethlehem Steel FC: Ofeimu had a goal and assist, won 5 of 7 duels and made three interceptions and six recoveries in Steel FC’s comeback victory against Swope Park. D – Leland Archer, Charleston Battery: Archer recorded nine clearances, won 7 of 8 duels and made six recoveries and two interceptions as the Battery shut out Charlotte in their Southern Derby victory. M – Leo Fernandes, Tampa Bay Rowdies: Fernandes recorded two assists in a strong two-way performance that also saw him win 6 of 8 duels and claim seven recoveries. M – Darwin Jones, Orange County SC: Jones notched both goals and completed 17 of 21 passes as Orange County took its first victory of the 2019 season with a 2-0 win against Colorado Springs. M – Kai Koreniuk, LA Galaxy II: Koreniuk had two goals and one assist as Los Dos took their second consecutive victory with a 4-2 win against Tulsa Roughnecks FC. M – Jaime Villarreal, Sacramento Republic FC: Villarreal had the initial shot that led to Republic FC’s game-winning goal against Austin on Saturday and recorded three key passes and completed 58 of 70 passes overall. F – Daniel Rios, Nashville SC: Rios struck twice, won 10 of 17 duels and completed 16 of 23 passes to help power NSC to a convincing 3-0 victory on the road against Ottawa Fury FC. F – Sebastian Guenzatti, Tampa Bay Rowdies: Guenzatti had a pair of goals as the Rowdies continued their undefeated start with a convincing 4-0 victory against Hartford Athletic. F – Douglas Martinez, Real Monarchs SLC: Martinez laid on a pair of assists and won 7 of 13 duels in leading the Monarchs’ front line in their 3-1 victory against Reno 1868 FC.